My heart is being filled and my wallet emptied anew now that I've started wandering into the young adult section of my local bookstores. Darn you Roald Dahl and your awesomeness. 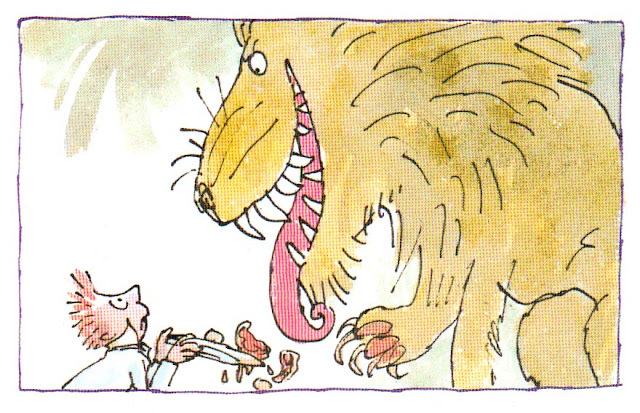 I'm very interested in longer chapter books of oldish that have some pictures and this past week we've been devouring Mr. Dahl at bedtime (a turn of phrase Dahl, more than anyone, would've appreciated.) I'm continuing to read picture books during the day, but in the evenings, tucked under the covers before bed, we are branching out. Thus, My Father's Dragon, some Winnie the Pooh and Paddington Bear books and all the shorter titles of Dahl's I can get my hands on. First, we read the fabulous Esio Trot, then came The Giraffe and the Pelly and Me, then The Fantastic Mr Fox... The Magic Finger, The Enormous Crocodile, and last night, our first reading of the shorter but highly-poetic Dirty Beasts. All of these are right up my son's alley. Totally, his sense of humor, and it doesn't hurt that they're fun for grownups to read, as well. My husband keeps wanting to take over the reading half way through, and I won't let him because I wanna find out what happens. 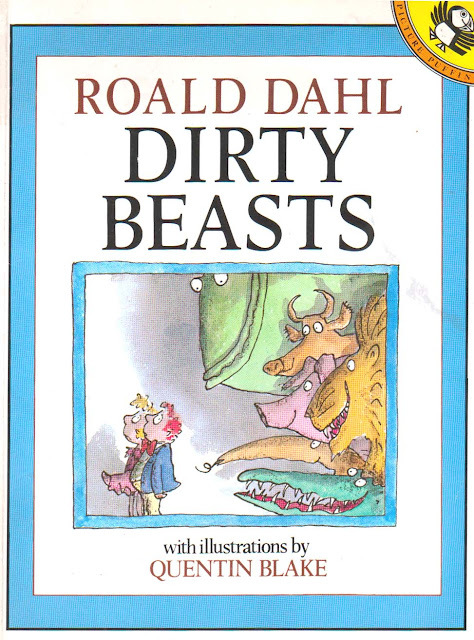 I must admit the only Dahl I had actually read previous to this was Charlie and the Chocolate Factory, so discovering his books, for me, is a giant revelation. Six juicy children for his lunch. Ahhhh... Dahl's books with Blake's illustrations.... never have an author and illustrator belonged together more. 80 thumbs up. 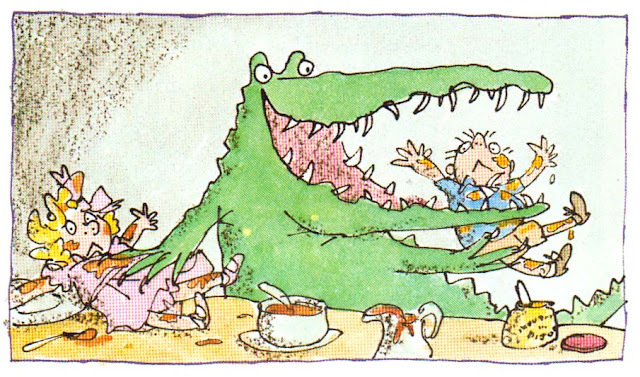 I know you're a William Steig fan, so if you don't know them already, you should look out for Steig's 3 chapter books; Dominic, The Real Thief, and Abel's Island. All incredible!!! I can't wait until my son is old enough to appreciate them. I found R.D. 's Matilda and Esio Trot recently, but I haven't had a chance to read them yet. Roald Dahl is hands down my favorite author of all time. I read him as a child, and transitioned into his works for adults as I got older. His book "The Witches" was very influential on me as a nine year old. I recommend his books to all my friends that look for something to give kids as a gift. Your son may enjoy Dahl's autobiographical book "Boy: Tales of Childhood" when he gets older. 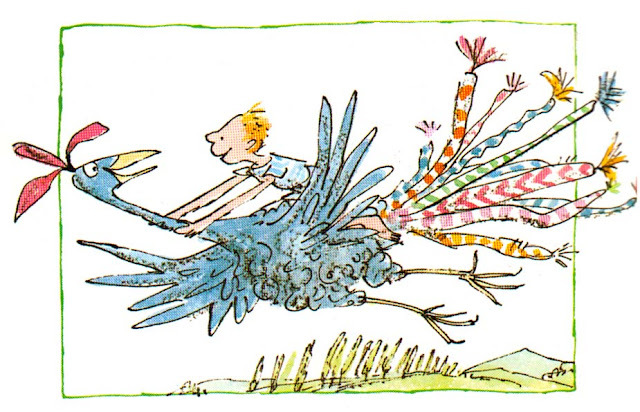 And Quentin Blake's illustrations are a perfect match to the writing! And Boy... I just bought that for myself! I have over 30 children books Nelson Doubleday Inc. If anyone is interested.